It's no secret that I am incredibly excited about the upcoming movie, The Muppets. Walt Disney Pictures has just released an interview with two of my favorite Muppets, Statler and Waldorf. In their usual fashion, Statler and Waldorf offer movie-goers advice. With Disney’s “The Muppets” coming out in theaters soon, Statler and Waldorf offer unsolicited advice and a whole lot of laughs about what to watch for at the theater. WALDORF: …one that doesn’t face the screen! STATLER: …they’ll be releasing a sequel soon! WALDORF: Don’t talk on your cell phone during the movie…. STATLER: ...it might wake us up! STATLER: …welcome to my world. WALDORF: Sometimes the movie is not out of focus—you are. STATLER: …sit next to us! WALDORF: Don’t say you haven’t been warned. 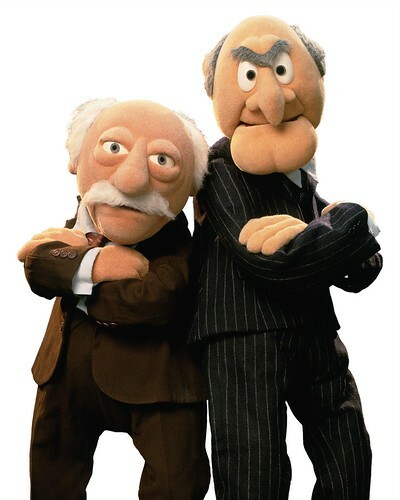 To see Statler and Waldorf in the balcony (where they belong) and other Muppets, check out http://disney.go.com/muppets/portfolio/homepage.html. The Muppets opens on November 23, 2011. See you there!